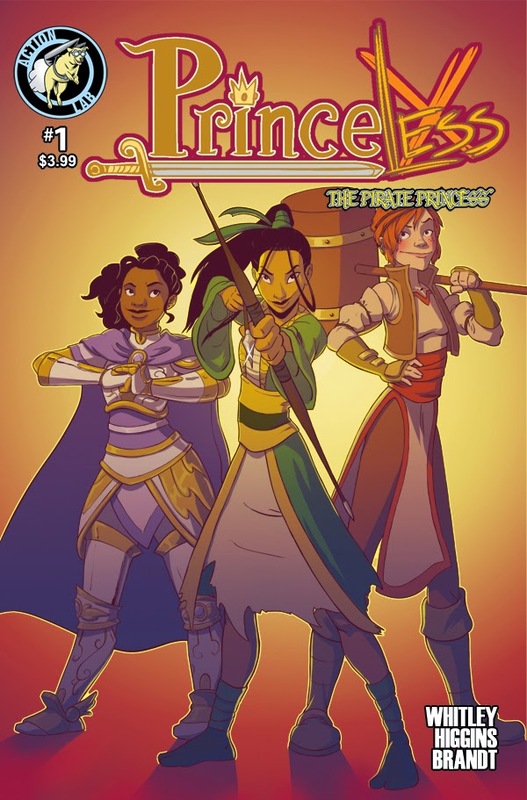 The Fellowship was fortunate enough to obtain a copy of PRINCELESS: THE PIRATE PRINCESS #1 from Action Lab Comics. Jeremy Whitley writes, with art by Rosy Higgins and Ted Brandt. Raven is a different kind of princess; her father is “the scourge of the four kings.” She’s also known by another name – the Black Arrow – which makes sailors everywhere run in fear. But she has been betrayed and locked in a tower. Enter Adrienne and Bedelia, who free her in their usual trouble-making manner. Now all Raven can think about is revenge. For those of you not familiar with the Princeless series, Adrienne is on a quest to rescue her sisters, all trapped in the usual princess style. She’s a knight, and she gets a lot of resistance in her travels (“girls can’t be knights!”). The books use comedy to overcome a lot of it, and the fantasy adventure is good old-fashioned fun. This book is no exception in either case, and Raven fits in well. And I’ve always liked the art in these books; the style works great for the fantasy genre. So if you’re into funny fantasy with strong female characters, the Princeless books are a great place to get your fix. This book is a wonderful jumping-on point. PRINCELESS: THE PIRATE PRINCESS #1 is available now at your FLCS or at actionlabcomics.com.